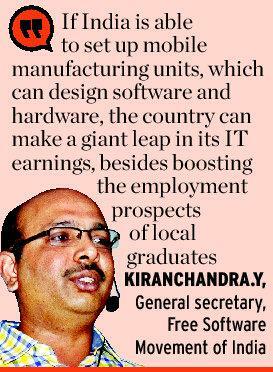 If India is able to set up mobile manufacturing units, which can design software and hardware, the country can make a giant leap in its IT earnings, besides boosting the employment prospects of local graduates, Mr. Kiranchandra said. Similarly, the country is forced to buy proprietary software to host websites, which have their servers and data centres in the US and other countries. “We have about one crore websites, and even going by the conservative estimate of each website costing Rs. 10,000, we have a market of Rs. 10,000 crore, which is being captured by other countries,” he said. 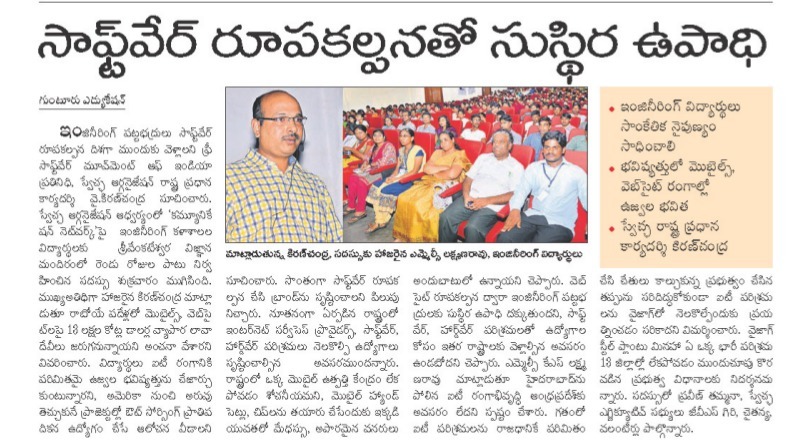 Free Software Movement of India, which is an extension of Swecha, an organisation that introduced free Telugu software. Into the decennial year, the Free Software Movement is drawing strength from a community of IT professionals opposed to proprietary software.